Birmingham gets a rare treat this Sunday, February 26th when Lamar Morris is the guest at Small Stages. Lamar was leader of the “Cheatin’ Hearts” and “The Bama Band” for twenty years. These were supporting bands for Hank Williams, Jr. A person doesn’t hold that position for that long without being good. Lamar is also a successful song writer. He penned Hank Jr’s first number 1 single, “Eleven Roses” and has written songs for some of the biggest stars in country music including Loretta Lynn, Lefty Frizell, Faron Young, Mel Tillis, Don Gibson, Billy Walker, Jim Ed Brown and Johnny Rodriquez. 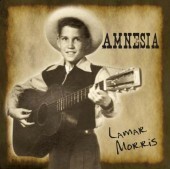 “Amnesia” is Lamar’s newest music compilation and includes 10 new songs by this south Alabama songwriter and performer. This Sunday afternoon, Lamar will perform in Birmingham at Small Stages. Get more information and RSVP at www.SmallStages.com. Lamar’s website is www.LamarMorris.com.